The Glen of Imaal Terrier is an active yet easygoing, affectionate, gentle, and devoted dog. He is relaxed and calm indoors, an adoring companion who wants to be near you or snoozing at your feet. Outdoors he is an intense, fearless, rambunctious, hardworking and athletic dog who likes tough-and-tumble games and long, energetic walks. Although he is a hardy dog who doesn't constantly demand attention and can be left alone or kenneled for short periods of time, he needs to be involved with his family and craves human contact. He is sensitive to your moods, as wants to be physically close to you. He is not a dog who can be left alone in the yard. When ignored or bored he becomes restless, and may chase or dig. He loves to dig! He can be a challenging dog to train because although he is a quick learner and eager to please you, he can be stubborn and strong-willed, yet sensitive to harsh corrections and scoldings. You will need to be gentle but firm and consistent to train him, and should avoid bribing him with food treats. He isn't a hyper dog but he does have lots of energy. Inside the house he'll make his own fun by running around in circles! He also needs long daily walks and chances to romp and play in a safely enclosed park or wooded area. When outdoors, he should always be in a secure area or on a leash, because he will chase and may do harm to cats and other small animals. He can be feisty or even aggressive toward other dogs. He can sometimes get along with cats and dogs he has been raised with since puppyhood. He can't be trusted around smaller, rodent pets. He is friendly around human visitors and generally polite to them. He makes a good watchdog because he is brave, protective and territorial and he has a deep, resonant bark that sounds as though it's coming from a much larger dog. He is not a yappy dog and generally only barks for a reason. He is playful, loving and trustworthy with children, although he may be too rough and rambunctious for very young children. He loves to travel and ride in cars. You need to be cautious with him around water, because he is not a good swimmer and can drown. He is a very low shedder, and so would be a good pet if you like your house neat and tidy. The Glen of Imaal Terrier is 12 to 14 inches tall (to shoulders) and weighs 25 to 35 pounds. 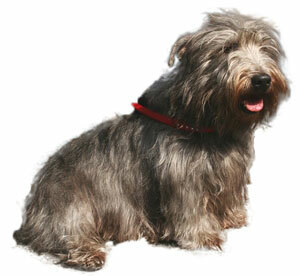 He has a medium-length double coat consisting of a wiry outer coat and a soft, thick undercoat. His coat color can be wheat, blue, or brindle. The Glen of Imaal Terrier hails from Ireland, and although he has been in existence for hundreds of years he has only recently become known outside his home country. He was bred to hunt vermin, fox, and badger, and was prized for hunting silently and stealthily. In the early 20th century he began to be shown, and in 1934 was recognized by the Irish Kennel Club. The first "Glens" began arriving in the United States in the 1980's, and the Glen of Imaal Terrier Club of America was founded in 1986. He was recently (2004) admitted to the AKC.